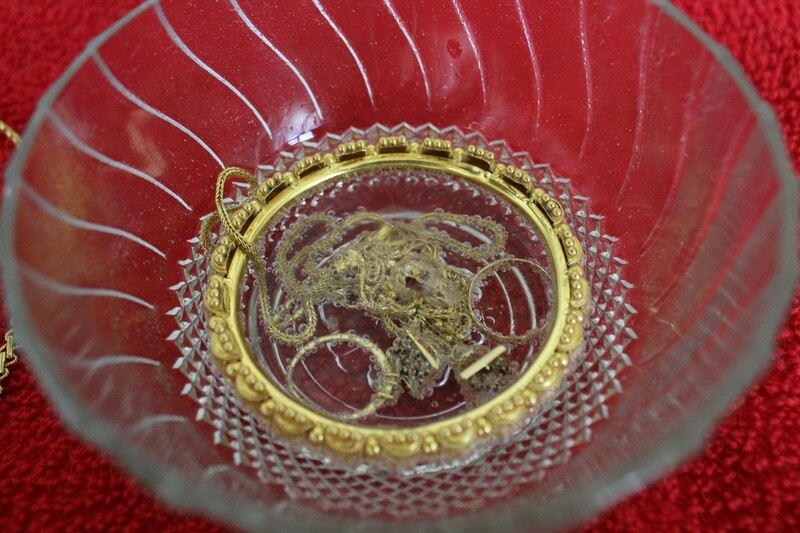 Cleaning gold jewelry at home is easy, safe and quick. Since gold does not tarnish like silver you do not need any special material to make your gold jewelry shine, it just takes a few minutes of care to restore them to their original glory. 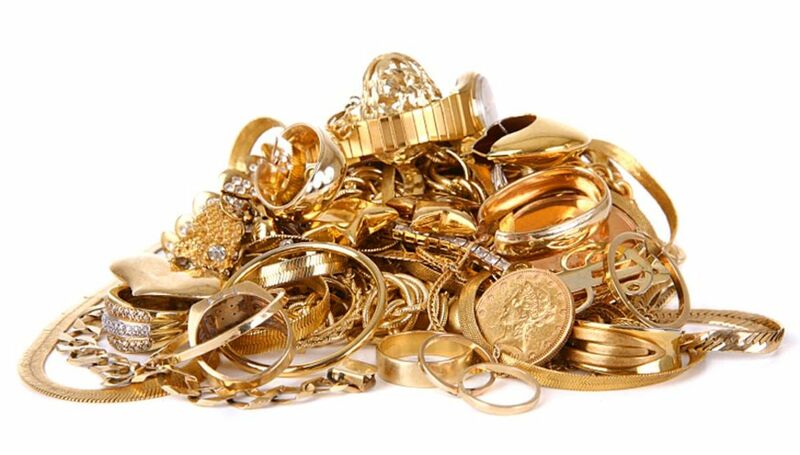 Wearing gold jewelry especially rings, wedding bands and chain on a regular basis causes them to get encrusted with dirt, grime and oils from the body, which makes them dull and plain. The soaps we use while we wash or bathe also leave a residue on your jewelry robbing them of their sheen. Having paid a hefty price to buy them, I am sure you would not mind spending a few minutes to clean your gold jewelry at home. The satisfaction of seeing your precious jewelry gleam on your person would be reward in itself. This is a list of all that you need for all the methods of cleaning. You may use whatever you have at hand. 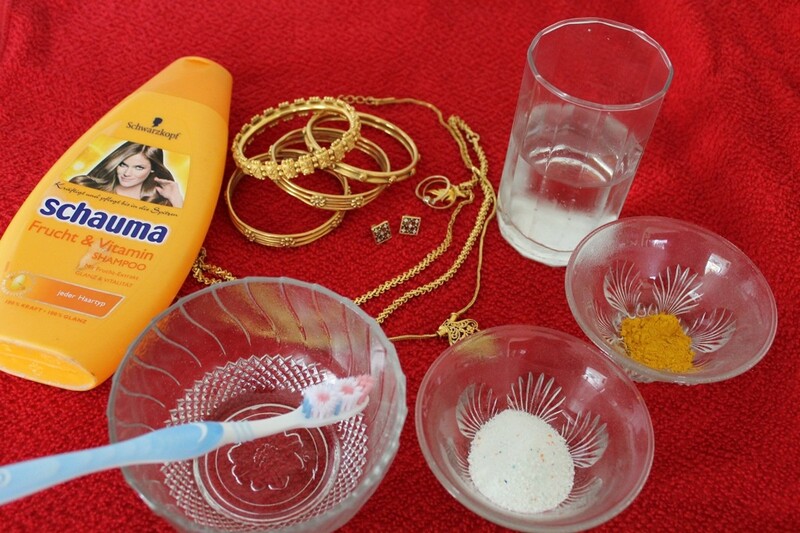 Here is a whole bunch of methods to clean your gold jewelry at home. These do-it-yourself tips could save you some money and possibly protect your jewels too. Take a bowl of warm water; add a few drops of shampoo to it. Stir it well and lather it up. 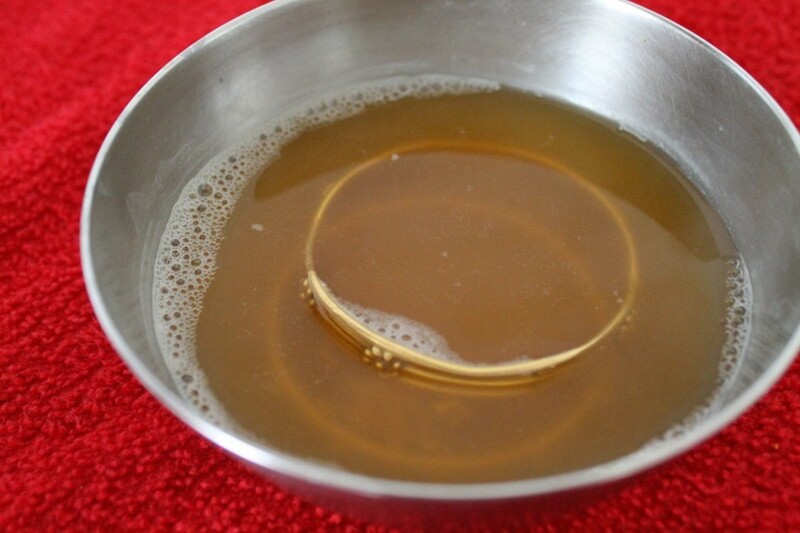 Soak your solid gold jewelry in it for about ten minutes. If your jewelry has crevices and filigree work, use a soft brush to dislodge the dirt. Do not forget to brush lightly under the rims of your rings. Rinse in cold water and wipe dry on a soft lint free cloth. Use a polishing cloth to polish and bring the sheen back to your jewelry. 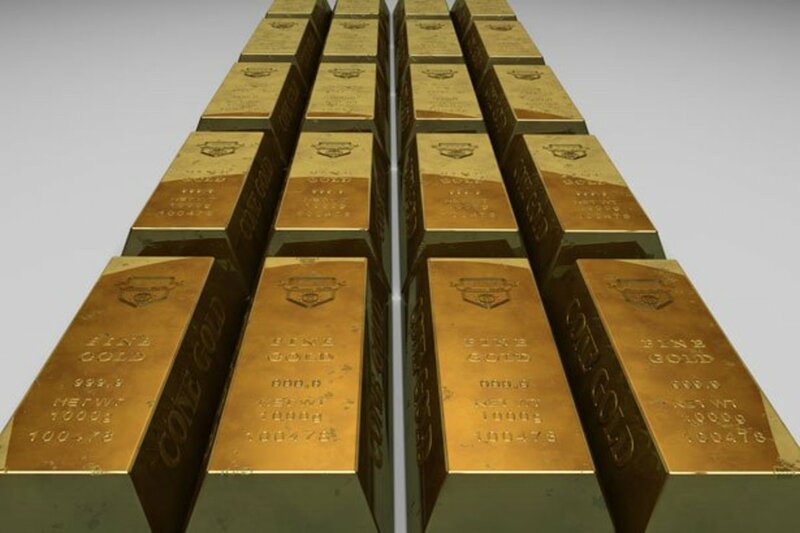 Handle your gold delicately. You could use bleach free detergent in warm water following procedure one to clean your jewelry. Use half teaspoon of detergent for a cup full of water. Take care to see that all the detergent is dissolved before you put in your jewelry to soak. Brush and wipe dry as mentioned above. Apply a light coat of toothpaste on your jewelry and leave them for about five minutes. Soak them in a bowl of warm water for another five minutes and brush away the dirt with a soft brush. 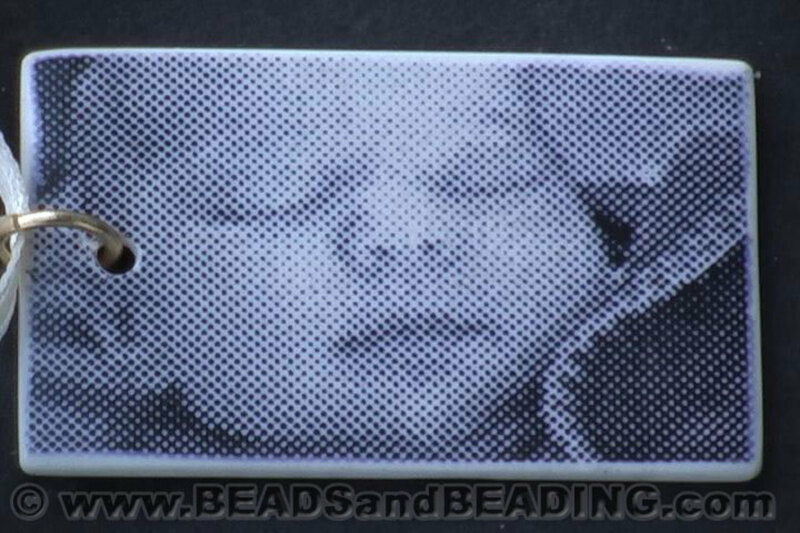 This can be done for jewelry that does not have much filigree type of work on the surface. Wipe with cloth and polish with a clean polishing cloth. Leave them to dry for a few hours before storing them. 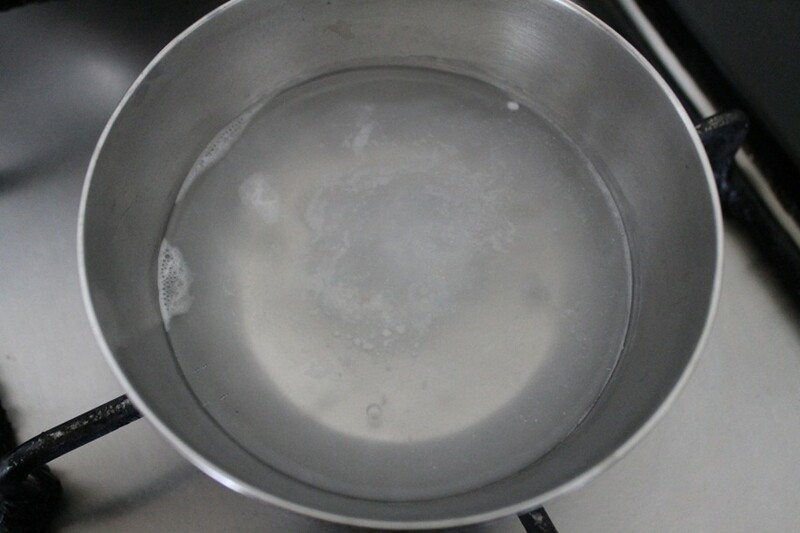 Boil a cup of water, add half a teaspoon of shampoo or detergent without bleach and stir it well. Now add half a teaspoon of turmeric powder. Let it bubble for a couple of seconds. Switch off your stove. Place your solid gold jewelry in the bowl. Do not worry when the color of the water changes to red from yellow. 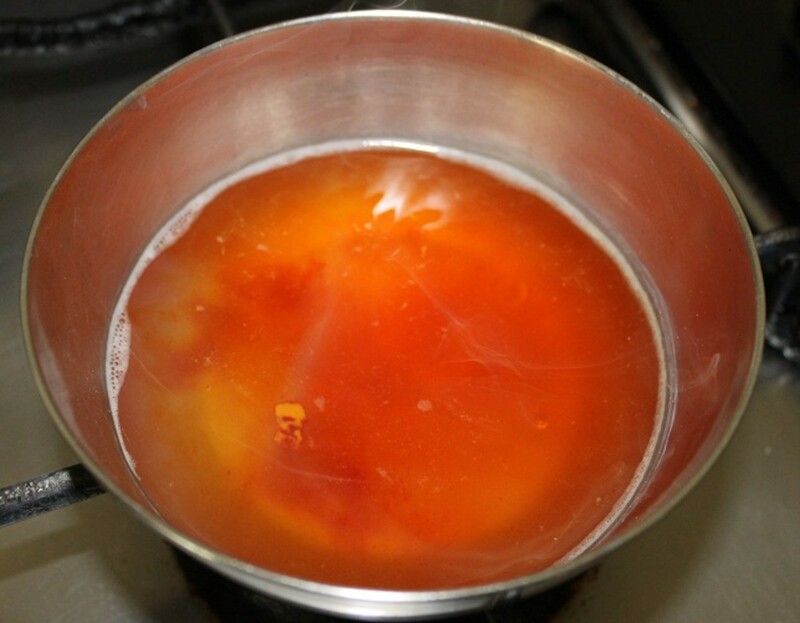 This is due to the reaction of turmeric with the chemicals in the soap. Let it soak for about ten minutes before brushing out the dirt and rinsing it off. Dry and polish them as in other procedures. This brings an extra shine to plain gold. Soak your jewels in club soda for five to ten minutes lightly brush it away with a toothbrush before rinsing and drying it as mentioned in procedure one. Dip a toothbrush in a solution of one part shampoo and three parts water, shake off the excess water and lightly brush your studded jewelry. Do not soak it in water. Rinse and wipe with a lint free cloth. Leave the gem/diamond facing downward on a towel and let it dry for sometime before you store them. If diamond or precious stone is visible from behind make sure to clean those parts too with your brush before rinsing off. Leave your rings, bracelets, pendants or bangles which are diamond/gem studded in a small cap full of talcum powder overnight. Remove them, shake of the talcum powder, wipe them with a polishing cloth until you get rid of all the talcum powder. Talcum powder draws out the oil or grease that makes the diamonds in your jewelry dull. Wiping this should be done with a delicate touch, polish them until you bring back the glimmer. Alternately, you could take your jewels to your jeweler once a year or as often as you need them, to get a thorough cleaning. It is useful to have your jewelry cleaned yearly by automatic cleaning equipment such as - an ultrasonic, ionic or steam cleaner. This helps remove all traces of dirt and grime and bring back the glow on your jewels. Always wear your jewelry after you finish applying your makeup. This helps avoid getting creams and makeup on to your jewelry. Wash your hands before handling your jewelry. 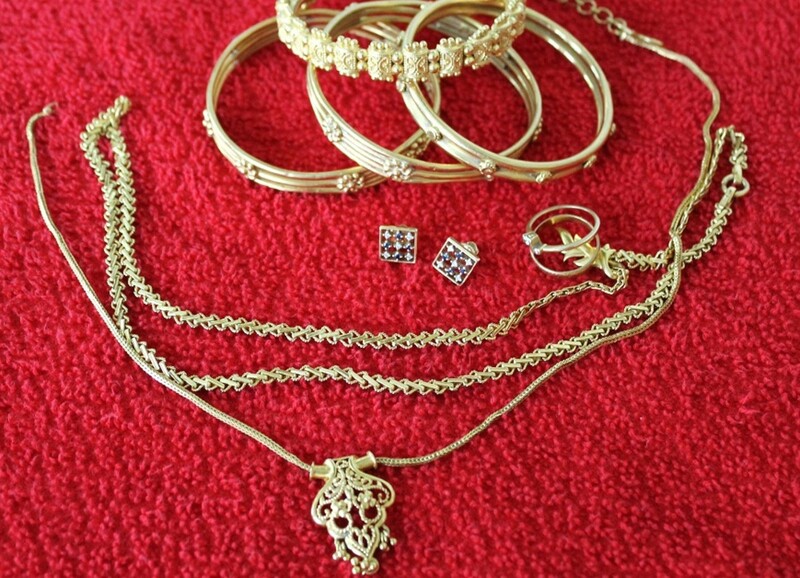 Remove jewelry (especially rings, bangles, bracelets, etc) before working with household chemicals and bleaches. 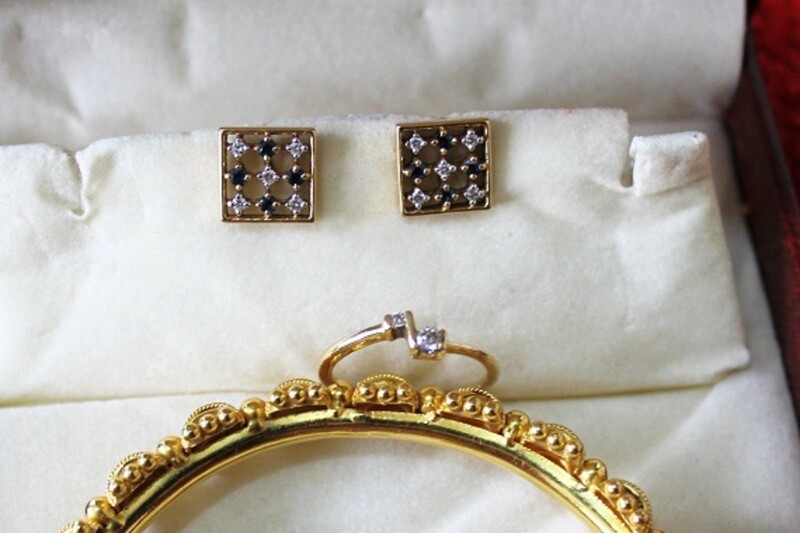 Store gold jewelry separately in velvet lined jewelry boxes or wrap them in soft tissues or silk in jewelry cases. Do not throw them into a draw with other stuff. Your jewels could get scratched, tarnished and lose their luster. 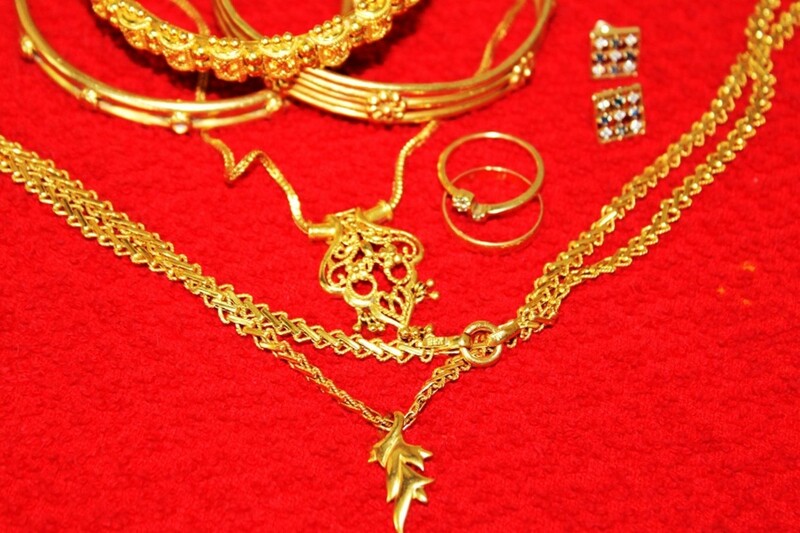 Do not store gold and other jewelry together. Remove jewelry before getting into a swimming pool, as the chlorine in the water could erode the metal over a period of time. You gave a considerable number of methods especially for non-professionals, i.e. for a home treatment of the issue. Unfortunately for the glass jewels there are not so many methods, and we often have to make it with soap and water after disassembling and removing all the jewelry elements. Rosemay50, I am glad that you found it on time for the cleaning.. Using turmeric adds that extra glow and color to plain gold jewelry, a common method of cleaning jewelry in India. I am not sure if this is as well known in other countries. Thanks for looking this up .. have a great day. This is a job I've been planning to do for weeks so I was pleased to find this useful piece. I would never have thought to use tumeric. Ruby, I appreciate you stopping by to comment... Thanks for the encouragement... I need it now :) Have a great day. I never thought of using toothpaste. Great ideas. Thank's..
SkeetyD, Thanks for taking the time to read this hub. I appreciate this very much. Have a lovely day. Pamela, Thanks for taking the time to look up this hub... I had top clean some jewelry and decided to make a hub of it.. albeit without much help, and so some awkward picture..I hope to rectify that soon. Have a great day. There are certainly more ways to clean gold jewelry than I knew. Thanks for sharing the information.